All the children at the Sangita home start their education at the age of 5 . 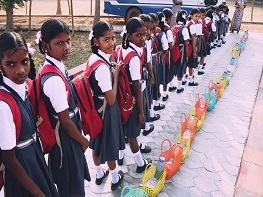 They study in one of the private English School in Padappai town . We realised the need to educate the children in the medium of English realising the fact that they will be able to cope with the city bred children for higher education beyond school . At present 85 children study from classes Lower kinder garten upto grade 8. One of our oldest child is in her I st year of Masters in Business Administration and 5 others doing their under graduation. Most of our children are class toppers and its fulfilling to know that we are privileged to educate them. All that seemed to be a very distant dream once upon a time has become a reality now. All glory and honour to God Almighty.